Mushrooms stir fry with garlic chives. With hints of red chilly and balsamic vinegar. 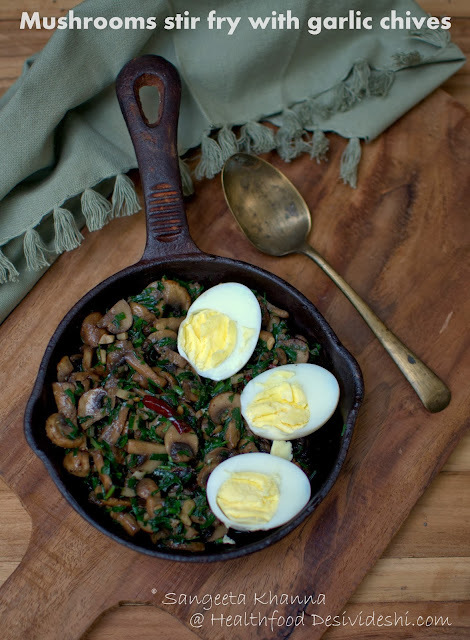 Mushrooms are packed with minerals and some vitamins and I like using them when they are in season. We do get button mushrooms throughout the year but the best ones come in the cooler months and I keep adding them to my stews and soups all the time. Sometimes a stir fried mushrooms with spring onion or Garlic chives is a good accompaniment to my egg meals. Yes I am lazy to cook my lunch mostly as now I am alone at lunch time. A plate full of wilted spinach, a large serving of stir fried green beans or any such quick vegetable with boiled or fried eggs becomes a convenient yet tasty meal. This one I had straight out of the frying pan. Garlic chives we don't get easily around the neighborhood markets and whenever I get a large bunch, I make sure I freeze the leftovers. Sometimes the chives from the garden are frozen when I am not in a mood to use them. I used the frozen garlic chives directly sprinkled into the pan this time and the mushrooms got a new life. Frozen chives work well and a small ziplock bag of these is always there in my freezer. On a recent visit to a beautiful hill resort Te Aroha, where I am working with the F&B team right now, I saw these beautiful blooms of garlic chives. The ones in my garden rarely bloom in Delhi climate so I was overwhelmed seeing these beauties. I had to use them in the food of course. Naturally grown herbs without any pesticides are great addition to simple salads to make them a notch up. both on the looks and taste scale. The blooms of garlic chives are edible too and I made a beautiful salad with locally grown potatoes and thin slices of cauliflowers and broccoli. This salad was inspired by Chef Maurizio's green beans salad. I keep making this salad in various forms and it keeps impressing me each time. 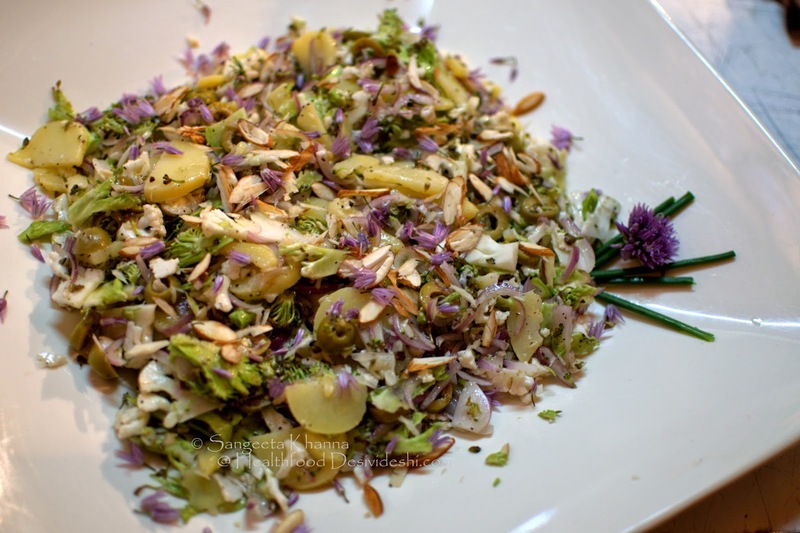 Look at this salad without any fresh greens but a generous garnish of tiny garlic chive flowers. 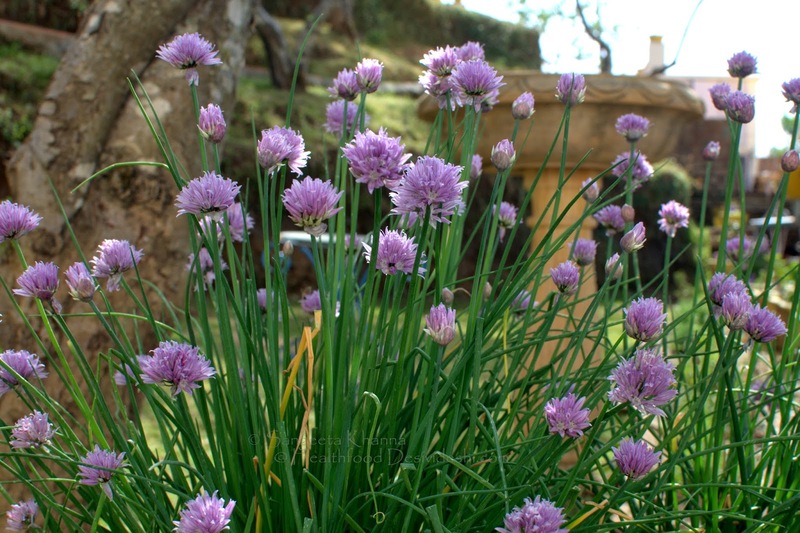 When the blooms are not available, I make do with my home grown chives. Fresh or frozen, they make beautifully fragrant stir fries and egg scrambles. 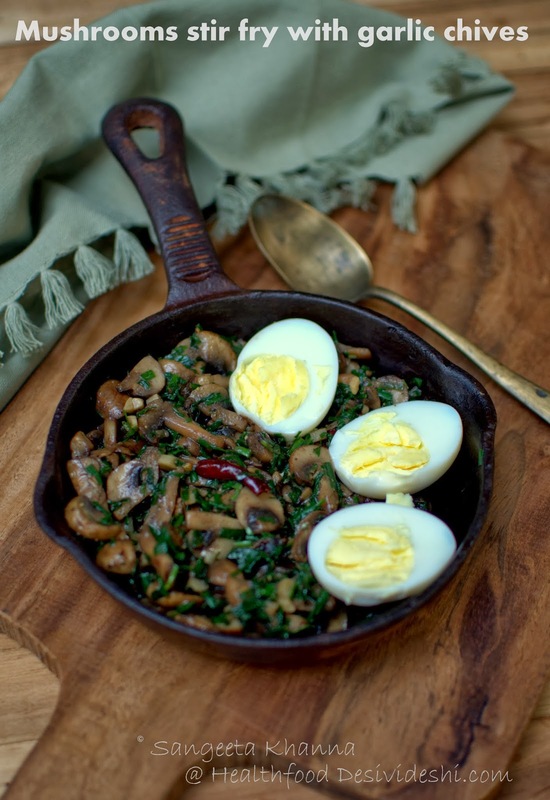 Here is the recipe of balsamic infused mushrooms with garlic chives. Heat the oil in a pan and tip in the dry red chillies broken. Add the chopped garlic and fry till fragrant. Now add the chopped mushrooms and salt, stir fry till the mushrooms wilt. Add the garlic chives and toss some more so the chives just wilt. Take off the heat and serve hot with any meal you like. This mushrooms and garlic chives stir fry makes a nice pizza topping or a good accompaniment to a grilled chicken kind of meal. You can use the greens of the regular garlic too for this recipe and the flavours will be absolutely yummy. After all garlic and mushrooms make a nice combination anyway.